In honor of Halloween’s approach, what better way to theme your own, personal Haunt than by using the complete, original 1980 soundtrack from the line of the Demon at both Great America’s. Yes, the “Demon Song” has been online for some time – but not the whole, nearly 30 minute queue recording, so enjoy! A word of warning – this track is seriously corny! In only a few, short years, Halloween Haunt at California’s Great America has gone from two “hand me down” mazes from Knott’s Berry Farm to easily the de facto Halloween event in Northern California. Now with eight (8) mazes, three dedicated “scare zones” and enough fog machines and tinted lighting to make any rock concert jealous – the Haunt is now worthy of being up for comparison to the event that initially spawned it in Southern California. The entertainment begins just as you enter the front gate to the park. Fire cannons (yes, you read that correctly) have been installed along the reflecting pool of Carousel Columbia. Never did I think I would feel the heat of flames on a relaxing ride like Columbia – then again, this IS Haunt. Consider walking into Carousel Plaza your “baptism by fire” to Haunt. The only thing that would make it better would be to run the carousel backwards. To the right of the carousel, lies the first of two new mazes this year, “Dia de los Muertos.” As you can imagine, it’s a Latin themed maze, complete with Spanish-talking zombies and dizzying effects. The artwork alone makes the maze worth going into (and we STRONGLY recommend getting a pair of 3D glasses for $1.00 at the entrance). Those 3D glasses can also be used in the “CarnEVIL” maze in Orleans Place. At the back of the park lies Zombie High, the other new maze for 2013. The building, which lies behind the Grizzly roller coaster, was built specifically for this maze, but I imagine it will double as a Haunt storage warehouse in the off-season. Considering all the material necessary to pull this event off now – it would make sense to expand the “backlot storage” the park currently has. “Zombie High” is modeled after Shows Director, Clayton Lawrence’s old high school, down to the mascot. Of course, I’m guessing he didn’t have all the zombies and blood, there. See if you can catch all the inside jokes and macabre humor – just don’t upset the Principal. The eight mazes and elaborate theming in the park would have been enough to placate most Halloween fans – but then California’s Great America did something celebrated by park fans and observers…they didn’t stop there. Back in March, Park Spokesperson Roger Ross stressed that, “Cedar Fair is committed to California’s Great America. We’re replacing roofs…there’s fresh paint everywhere.” And you know what? He wasn’t kidding. That same spirit and drive to revive the park to it’s former glory and true potential is clearly evident in all aspects of the Haunt this year. Did you really need fire cannons at the front entrance? Not really – but who the hell cares – they’re freaking awesome! In addition to the two new mazes and amazing theming throughout the park, Great America now offers a pre-scare meal, dubbed “Madame Maries Voodoo Chophouse.” The $22.99 add-on to your admission includes: early entry to the park, an all-you-can-eat, cajun-themed buffet, single “Fright Lane” entry to a maze of your choice and apparently very exclusive ride time on Gold Striker! Now, most buffets at amusement parks are well – not worth writing home about. But, this meal included: fried catfish, creole, biscuits, prime rib(!) and soft drinks among other items. There’s even a chocolate fountain, complete with fruit and other dessert options. It shattered my notion of what I could eat an an amusement park outside of the Disneyland Resort. The park also offers a “Fright Feast” for $13.99, with more standard, picnic grove food options. A combination “Cirque” style show with an intriguing storyline, “Blades of Horror” is easily the best show I have seen at California’s Great America, going back to the KECO days of the late 1980’s. The talent is largely local and according to many staff members, the show was largely driven by the performers simply wanting to keep performing. It has the look and feel of a large budget show you’d catch in any Las Vegas resort – and yet it’s right here, in the middle of Haunt. The acrobatics, aerials stunts and exhibitions of these actors is nothing short of spectacular. The grand finale alone is something that simply cannot be missed and may never be duplicated again. There you have it – not one, but no less than five incredible reasons to visit California’s Great America and their burgeoning Halloween Haunt event. As the days get closer to Halloween, it’s best to schedule your visit on either a Sunday or better still – visit as soon as possible. The crowds will only get larger as the holiday approaches, and so does the cost of admission. Oh, and don’t show up to the park on Halloween – Haunt runs through October 27th. Halloween Heads – it’s time to get out to California’s Great America – and get your scream on. 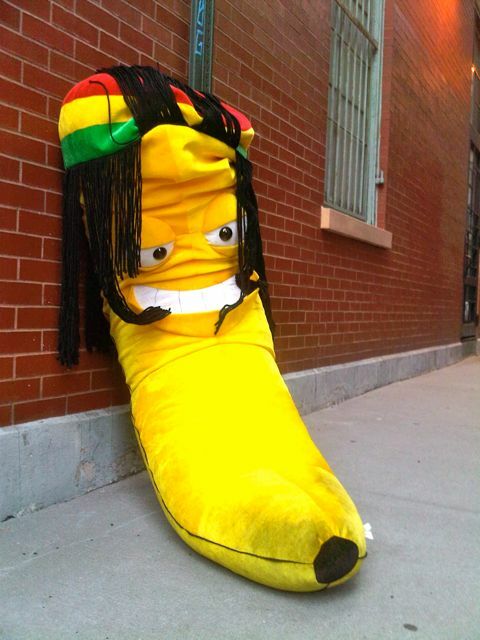 This “Rasta Banana” was worth so much to a man, that he blew his life savings trying to win it. And you thought carnival barkers were good at stretching the truth. In the game, contestants attempt to toss balls into a tub. Apparently, Gribbohm had been practicing the game at home for weeks before the fair – but when it was game time – the results weren’t so good. Considering the game offers one of the largest prizes at the fair, it should have been fair warning that this wasn’t going to be a cake walk. Predictably, all of Gribbohm’s attempts failed. “He dropped $300 in just a few minutes and said he went home to get $2,300 more and soon lost all of that as well,” according to a local TV station. Understatement of the century there. You think they just give these quality items away? Apparently, Gribbohm went back the next day to complain and the man running the game gave him back $600 – which at least validated his claim that he did spend wayyy too much money on a giant banana. Despite getting back $600 that he never should have, he still filed a report with the police. Gribbohm said that he’s considering a lawsuit. I wonder if he realizes that he can’t win there, either. It’s a Small, Litigious World After All! You might want to add, “It’s a world of lawsuits” to that refrain as well. Late last week, Disney got an early Easter present, in the form of an $8,000 judgement against them for not being able to evacuate a man off the ride for over 30 minutes. (The ride itself is anywhere from 12-15 minutes long normally). Considering how much other Disney lawsuits have been settled for, this one just might feel like a present to settle so low. So, how did we get here? Well, back in 2009, Jose Martinez, found himself stuck in the final “room” of the attraction the day after Thanksgiving. As per standard operating procedure, Disneyland employees were able to evacuate all the passengers from the ride…except Martinez – who is confined to a wheelchair due to paralysis. Apparently, Disneyland employes were unable to evacuate the wheelchair-bound Martinez and opted to try and fix the ride to get him back to the ride platform. Martinez’s attorney continued, “This is a really important ruling not just for (Martinez), but for anyone that rides the rides at Disneyland — because they do break down often and they do not tell people.” Anyone who’s ever visited Disney Parks know that the ride operators are some of the best in the business. As SOON as a ride breaks down, announcements are made and cast members generally walk out to the attraction (when they can) to speak with guests and re-assure them that everything is okay. The next quote finally broke me: “The court’s saying that this kind of injury is foreseeable and that (Disneyland) has a duty to warn people,” Geffen said. Ironically, the attraction – which was added in 1960, after the World’s Fair – was created in the hopes of spreading world peace via the youth of the world. Apparently, it now should incite fear. And legally, we have to state that these clips of copyrighted material are being used under the “Fair use Doctrine” of copyright law, for discussion, criticism, education or parody. In this case, we’re using them as examples of Disney making fun of itself to educate the readers of this blog. We’ve even shortened the clip playtime to the smallest possible to make our point. So beware, small world riders – you could find yourself in court the next time a ride song traumatizes you! April 4, 2013 | Categories: Amusement Parks, General Travel, Theme Parks | Tags: american thrills, amusement, amusement park, amusement parks, appeal, behind the scenes, California, carnivals, case law, court, disney, disney world, disneyland, fun, great american thrills, host, inherent risk, injury, insider, it's a small world, Jose Martinez, kris rowberry, kristopher rowberry, lawsuit, lion king, new talent, risk, roller coaster, roller coasters, rowberry, ruling, theme park review, theme parks, travel, travel tip, vacations, walt disney | Comments Off on It’s a Small, Litigious World After All! The ornate, Orleans-inspired entrance to the bumper cars that are at the heart of the lawsuit. Today was a victory for amusement parks and fans alike – the California Supreme Court has ruled in favor of amusement parks and ride operators, by throwing out a lawsuit against (then) Paramount’s Great America that involved their bumper cars. Continuing through the court documents, near the end of the ride cycle, which generally lasts for about a minute, “(the) plaintiff’s bumper car was bumped from the front and then from behind. Feeling a need to brace herself, (the) plaintiff put her hand on the car’s “dashboard.” That’s when she realized her wrist was fractured. The lawsuit originally claimed that the park was negligent in preventing injuries to riders and that the park knowingly operated a ride that caused injuries. A lower court found the park not liable, but upon appeal, the decision was reversed. The court found that while these impacts were not highly dangerous, but that sudden changes in speed and direction do carry an inherent risk of minor injuries. To change this portion of the ride would be eliminating the very character of the ride itself. In a small portion of cases such as these, our understanding of technology and safety is improved. For instance, after several situations where people were falling or being pushed onto loading tracks in stations, parks installed the ubiquitous “air gate” preventing soon-to-be riders from falling or getting shoved into the path of an oncoming train. But because the industry is self-policed (I.E. a “killer” ride no longer has the appeal of the 1920’s), most of these lawsuits have done nothing but drive up the cost of business and removed (or renovated for the worse) attractions. People DO get injured at parks, yes. But they also get injured at home, in their beds and in the shower, too. Yet, you don’t see lawsuits from those events. Why should a park be any different? What was not discussed in the court papers was the possibility of a pre-existing condition. For all we know, Nalwa could have already had a hairline fracture that was aggravated by riding the bumper cars. This is not unheard of, as a child with a pre-existing heart condition died on Mission: Space at Epcot in Florida several years ago. So clearly, someone broke the rules, they rammed a car head-on. So how, exactly is that the parks’ responsibility? If you or a member of your family was rear ended on the freeway, would you sue the state for providing the venue for the crash? Let’s face it, more people are hurt or die DRIVING to amusement parks each year than inside them. So, did someone get needlessly injured? Do I feel bad that she was injured? Should the park be responsible for other’s behavior in the park, or even a pre-existing condition that Nalwa may have not been unaware of? I applaud the decision of the California Supreme Court, because by making this decision, they have re-affirmed our right to have traditional fun, without needless lawsuits ruining it for everyone else. That’s right, we continue to get our cotton candy lacked, sticky little fingers all over the internet! Those of you who are theme park or amusement park fans know that for many years, Discovery, A&E, History and Travel Channel would produce an onslaught of roller coaster and theme park programming right at the start to the summer fun season. As a fan of these shows for many years, I am sad to report that these shows have been in steep decline in recent years, especially considering all the upgrades to picture quality! The worst of these examples is “Bert the Conqueror” a show based on a premise similar to “Man vs. Food.” Consider they are from the same production company (Sharp Productions) it makes logistical sense. Sadly, while MvF can get away with some bending of facts, “Bert” deals much more with a factual information-based industry. Simply put, this show fails miserably at it. For example, in the show’s very first episode, Bert “conquered” the Cedar Point “Fearsome Foursome Challenge.” There’s only one problem…that challenge doesn’t exist. It was a complete fabrication to “attempt” to keep the conquering motif of the show, yet show coasters in the meantime.